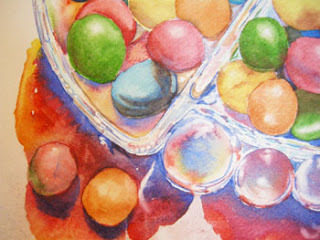 The remainder of work on this piece is just to refine the details in the candy dish, continue with various glazes of wet, transparent colors on the candies and to lift and soften areas that need either lighter values or softer edges. I used a number six round Silver Black Velvet brush (cheapjoes.com) for the detail areas. 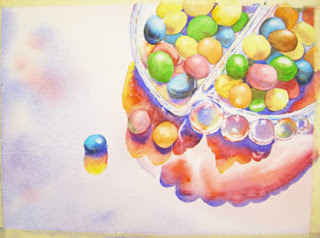 I used the colors from the candies and shadows to pull this together. I kept a close eye on the reference photo to indicate where the details were necessary - if they aren't necessary don't put them in!! !